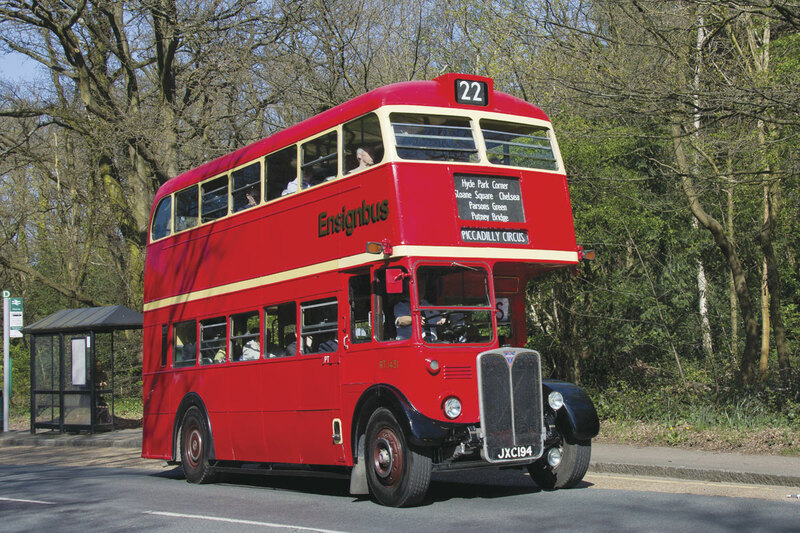 The London Bus Museum is now well established in its new home within the Brooklands Museum of car and aircraft fame. It has a modern display hall, named Cobham Hall in homage to the museum’s previous rural location, where the story of the London Bus from horsebus to Routemaster and beyond comes to life in vehicles and displays. Visitors are also able to see some of the restoration work in progress and experience film shows in the lower deck of an AEC RLH bus. 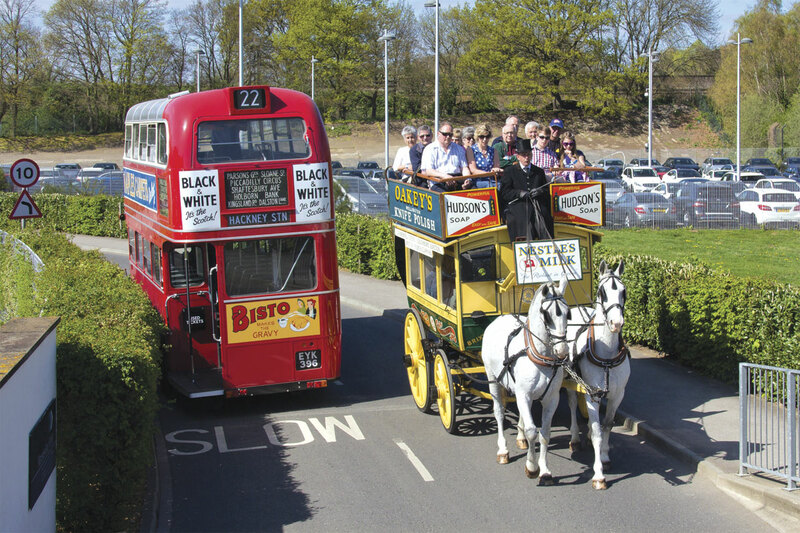 By encompassing some of the car parks of local office developments, the Spring Gathering can now be accommodated on the same site as the museum whilst still proving the opportunity for rides on both historic and modern vehicles operating to Weybridge Town Centre and Station. 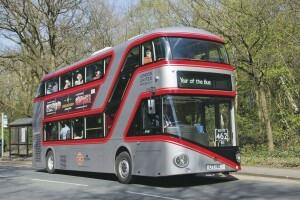 RT family vehicles were, as expected, to the fore on this but the one vehicle which appeared most in demand was the ‘Year of the bus’ silver liveried Wright New Routemaster which had gained London Bus Museum advertising for the day. 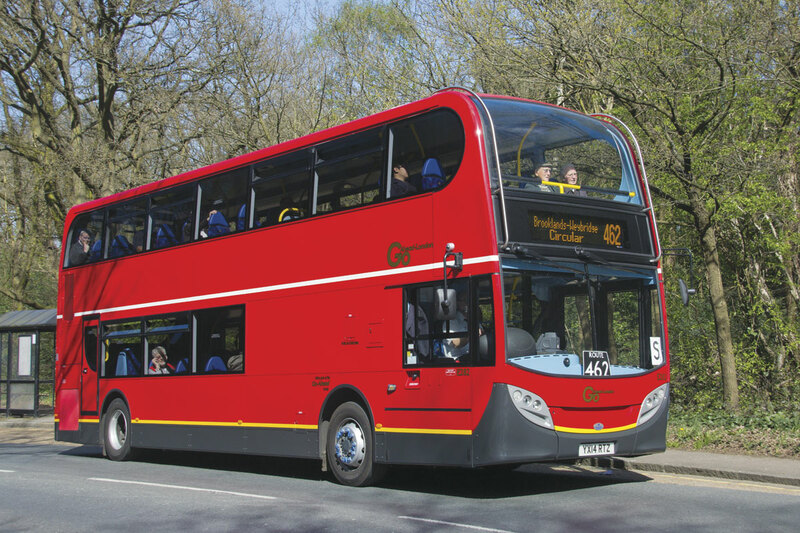 Another popular modern vehicle was a high specification ADL Enviro 400 from commercial operations at GoAhead London, the long wheelbase and single doorway being unusual for a London red liveried vehicle. Additional funds for the museum’s upkeep were raised from on-site tours by horse bus, the museum’s 1925 Dennis open top bus and RT1 itself. The museum has a large area of concrete hard standing leading up to the famous Brooklands banked track and this was filled with examples of the RT family in all it forms together with a few provincial contemporaries on similar AEC chassis. As part of the RT75 celebration, some 15 vehicles had worked in service on London’s route 22 during the previous day and many still carried destination displays from this event. During the day, most of the RT family display took part in a procession around the whole Brookland’s site, creating a fine spectacle as they returned through the museum’s steeply graded southern entrance. 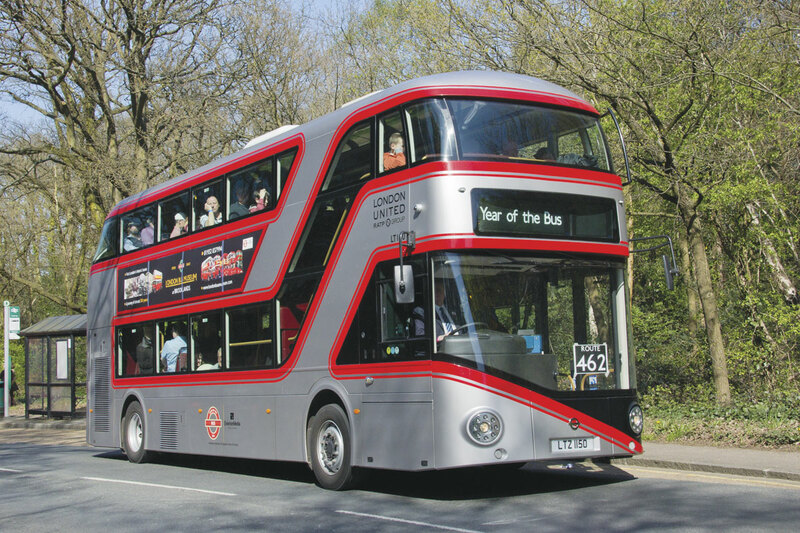 Whilst the RTs stole the limelight, there was also a good selection of Routemasters, itself celebrating its 60th anniversary this year and a variety of mainly modern vehicles from operators across the south and east of the UK. 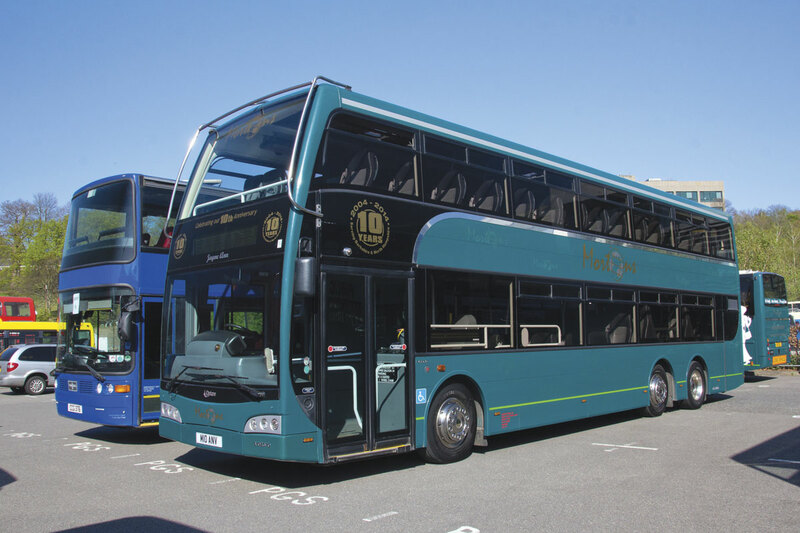 These included Delaine’s latest Wright Volvo double-decker and two high capacity vehicles from Mortons of Tadley, a 100 seat Volvo Optare Olympus double-deck coach and an unusual Volvo B10M Van Hool artic. Stagecoach presented two vehicles from its London fleet finished in retrospective liveries to celebrate the centenary of Catford garage, an Enviro 400 going back to the trams of the 1930s and an Enviro 200 in early 1990s style. Reading Buses contributed a Scania double-decker promoting their current charity of choice, Reading Launchpad, and there was one of the latest Wright Geminis from Brighton and Hove whilst Southern Transit showed some well presented members of its fleet. The Leyland Olympian is becoming popular in preservation and examples were shown in Metrobus and London Buses colours. The weather was kind to the RT75 events with sunshine throughout the day at Brooklands, helping swell the crowds drawn by both the Spring Gathering and Brookland’s own attractions including a Concorde. Such was the volume of early visitors that they overwhelmed the capacity of the Museum’s entry team and long queues built up, one of the few downsides of an otherwise excellent event. Destined to become the world’s largest ever standardised fleet, London Passenger Transport Board’s (LPTB) RT family began with a single vehicle, RT1 unveiled to the public in 1939. 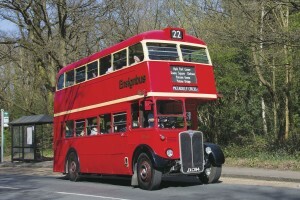 The vehicle’s layout followed the traditional London half cab, rear platform style evolved in the 1920s and surviving to the end of normal Routemaster operation in 2005. 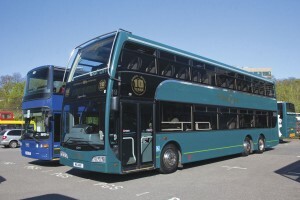 Mechanically, however, the RT chassis built by AEC in Southall incorporated the latest engine, transmission and braking technology and had been subjected to extensive trials with an old open staircase body before receiving the sleek 56 seat metal framed body built by LPTB itself in Chiswick. It is this body that has survived, combined with a later chassis to form the RT1 which takes the limelight at any event it attends. War delayed the mass production of the RT family although 150 were delivered in the early war years with superficially similar wooden framed bodies. With the end of the war, plans turned to replacing all London’s double-deck fleet with standardised RT family vehicles enabling bodies, chassis and components to be swapped at will during overhaul. 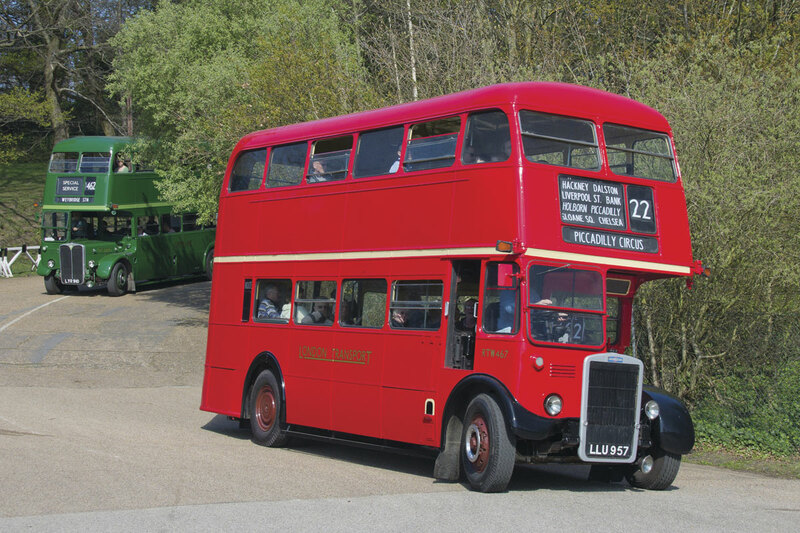 Nearly 7000 were eventually built although by the time the last were completed in 1954, the postwar boom in bus use was over and some were stored until 1958 when they were used to replace less standard members of the fleet. These included the wartime vehicles which became trainers and a small batch with less standard bodies by Cravens which were snapped up on the secondhand market. As well as Cravens, Park Royal, Weymann, Metro-Cammell and Leyland all provided bodies for the RT family whilst Leyland also augmented AEC chassis production with over 2000 units modified to align with the AEC product. The 500 Leyland chassis with Leyland bodies were eight feet (2.4m) wide, the first production vehicles of this size in London. 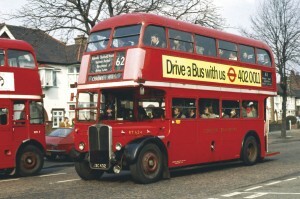 Normal replacement of the RT family was spread over nearly 20 years as the capital became disillusioned with the AEC Swift and Daimler Fleetline vehicles intended to sweep away both the RT and Routemaster families. Many RT family vehicles found new uses abroad, particularly in Sri Lanka and South Africa whilst not insignificant numbers became ‘Traditional English’ sightseeing buses around the globe. A weak bridge in London’s outer eastern suburbs prolonged the life of the last examples in London service, final withdrawal coming in April 1979.